Is it possible to create a device that would turn invisible, like a cloaking device? Is there some way to bend light around an object so it would appear invisible? Is invisibility even possible? Can scientists unlock the secrets of invisibility? Answer: A few years back, the answer to any question having to do with invisibility would have been a resounding "No," but now the answer is more of an "Eh, maybe." The field of optics has perhaps never been stranger than when exploring the subject of invisibility in recent years. Progress over the years with these metamaterials would come along every few months, it seemed, with new designs that focused on different segments of the electromagnetic spectrum. Once the initial insight and proof of concept was out there, it seemed that there was no end to the way that the metamaterials could be applied to make small objects invisible. In August of 2011, just 5 years after the initial proposal for the invisibility machine, these metamaterials are making objects invisible in the visible spectrum, according to two different teams working on the project. July 16, 2009 - Does Improved Invisibility Yield Silent Image? August 16, 2011 - Visible Spectrum Invisibility, At Last! Though I haven't reported on each and every advance, it does show that steady work has been performed over the last several years. It seems like very few months there was some sort of report coming out that some group had narrowed in on invisibility in a new band of the electromagnetic spectrum. At this rate, we'll have invisibility cloaks in no time! Basically, this method works because these exotic metamaterials are designed to have properties which don't normally show up in nature. Specifically, they can be designed so that they have a negative refractive index. Normally, when a light collides with a material, the angle of the light bends slightly due to the refractive index of the material. This happens, for example, with both glass and water. (Pay attention to your straw in a clear glass of ice water next time you're in a restaurant, and you'll see the effect of the light bending under refraction.) This is depicted in the graphic at the top of this page, when light goes into a "Conventional Material." Metamaterials designed with a negative refractive index, however, behave very differently. Notice in the graphic that the light beam doesn't just bend a little bit, but instead it flips completely, going down instead of upward. 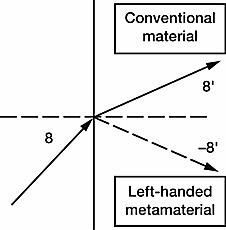 The geometry of the metamaterials actually makes the light's path bend dramatically, and it's this process of bending that allows for the invisibility. The light collides with the front of the object and, instead of reflecting back, it goes around the object and comes out the other side. A person (or computer camera, in the case of more exotic thermal or microwave wavelengths) positioned on the other side of the object would see the light from the other side as if the object wasn't there at all. Glass Ceiling: What Is It? Does One Exist? Did You Know People Have Invisible Stripes?